NOW on one DVD together with Running Mate— two films for the price of one! Editorial cartoonists mine the metaphors of our social landscape. This program takes up the questions of how cartoonists approach their work and the role of stereotypes in cartoon messages. 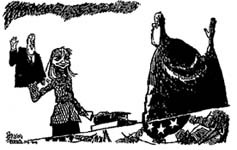 Nationally syndicated editorial cartoonists Jeff MacNelly, Mike Peters, Paul Szep, and Ann Telnaes (one of the very few women in the profession) comment on portrayals of Hillary Rodham Clinton, a First Lady who has tapped a deep reservoir of gender-based sentiments on the part of the U.S. public. They also reflect on why there are so few women in the editorial cartooning profession, and what that might mean both for the profession and for the reading public. The cartoonists' ability to engage us raises questions about the role that editorial cartoons may play not only in reflecting but also in shaping the terms of public discourse about gender issues. Understanding how the cartoons work is an exercise in visual literacy. Eye-opening examination of cartoonists' portrayal of Geraldine Ferraro during her unsuccessful candidacy for the U.S. Vice Presidency.